In Part I, we introduced the concepts of the Pioneer Myth and its interpretive framework. According to much of the historiography, San Francisco as the “Pacific Metropolis” was not codified in local and popular rhetoric until after the turn of the century and especially in the wake of the Panama-Pacific Exposition (1915). However, in the 1890s this urban identity seemed to already dominate many of the leading civic, business, and cultural elites’ rhetoric, including the largest newspapers of de Young and Spreckles. In 1897, the rush to the Klondike Gold Rush in particular, as well as European and Asian imperial conflicts, dominated the foreign media coverage in the papers. The reporting of these stories and the editorials that followed revealed an entrenched awareness of San Francisco as the regional metropolis of the Pacific coast. As I had mentioned in a previous post, “Commemorating Regional Empire, Part I,” San Francisco’s commercial-civic elite were especially vocal about their city’s regional dominance on the Pacific coast. What was it that the commercial-civic elite were so eager to express? What was it about San Francisco and its past that they thought was so exceptional? How did they explain the roots of their present success? And how did these ideas relate to the understanding of American Exceptionalism expressed in national politics and the media of the late 19th century? 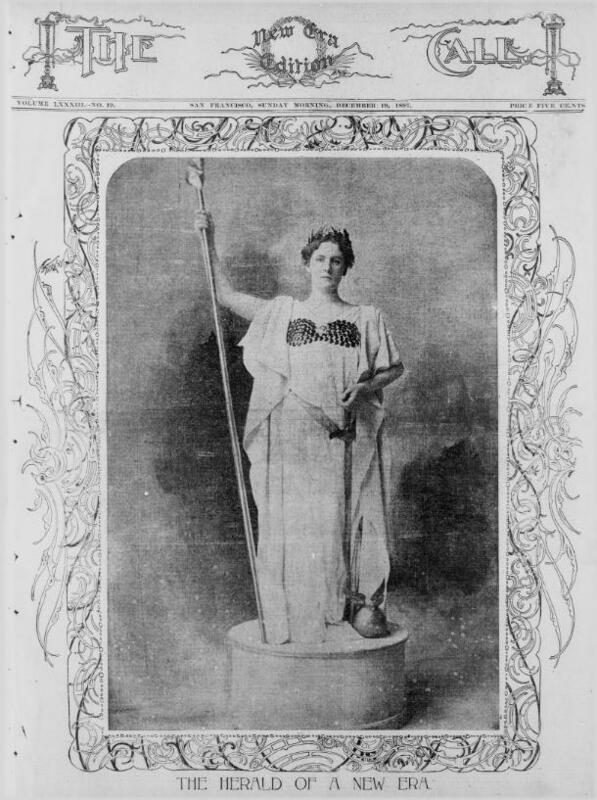 Image of California’s Minerva in “New Era Edition” of The San Francisco Call (December 19, 1897). Throughout the headlines of the San Francisco Chronicle, Call, and Examiner, the rush north to the Yukon Territory was framed and seemingly appropriated as what they saw as a naturally Californian and particularly San Franciscan event. Their understanding of San Francisco’s dominance over the Pacific Coast region led them to think it was only natural that the city would encapsulate and integrate the emerging markets into its urban grasp. 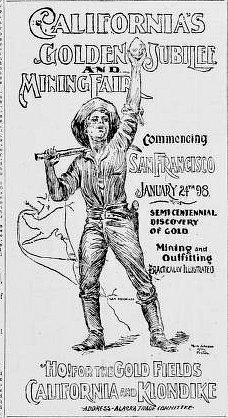 The city’s dominance in western mining, and its advantages as a supply route of the explosive Klondike market were expressed very forthrightly and implicitly in editorials, reports, and published opinions throughout November and December, 1897. The crisis in the Yukon Territory at Dawson City during the winter of 1897-98 becomes, for example, an opportunity for the editors of the Call and Chronicle to demonstrate not only their superior coverage of an event in a distant land, but also the logistical abilities of the city to come to the starving community’s aid. Only San Francisco, they argued, had the ability to mount and successfully outfit such a grand humanitarian operation to rescue the starving miners at Dawson City. This understanding of the city’s significance was also expressed at the expense of other regional hubs like Seattle and Los Angeles. One troubled relief effort for Dawson City by western regional competitor Seattle, for instance, leads to a media discussion of how the San Franciscan effort will be much more successful due to its superior people and natural urban advantages. Daily and weekly updates of ships in and out of the bay bolstered their claims of the superiority of San Francisco’s port and her sister city, Oakland with its supporting role. Interestingly, this urban identity demonstrated by the pages of the Chronicle and Call silences the fact that many of the migrants to the Arctic Circle were of many nations and ethnicities and in fact did not travel through San Francisco. Yet since many, and according to their claims the vast majority, would consume products transported by San Francisco on their way to the Klondike, these migrants would be commercial surrogates for San Francisco’s imperial grandeur in expanding markets. Handbill printed and published in December, 1897 for California’s Golden Jubilee to begin January 24, 1897. In addition, throughout the late 1890s, this same understanding of the city’s urban identity would be further employed throughout San Francisco’s media coverage interpreting the actions of competing empires across the world. As British, German, and Japanese efforts to open China to free market policies dominated the headlines for example, many San Franciscan’s saw themselves as the front line of America’s push to secure the search for opportunity abroad. What is particularly revealing is the city’s coverage for and against Hawaiian annexation. Market expansion it seemed, not territorial gain, dominated the rhetoric of US foreign policy in the late 19th century and San Francisco held a key role, they thought, in that market expansion. It is in this debate especially, where the changes to the American idea of the frontier are most visible. Opposition to annexation by many of San Francisco’s commercial-civic elite revealed not only their mainstream position in national politics about race, but also their regional commercial interests. Sugar barons like the Spreckels family decried annexation, as their exploitations of the laboring population would then be subject to US law. Similarly, many of San Francisco’s working-class saw annexation as the acceptance of inferior races into the American republican experiment. Although others did perceive some solidarity with the inhabitants of Hawaii and spoke of the benefits that US law could bring to the exploited laborer’s lives on the sugar plantations. However, few it seemed would go as far to suggest that these same laborer’s were ideal candidates for citizens, as would be the result of annexation. San Francisco’s unique class antagonism allowed for some empathy for the Spreckels family’s exploitations of native and migrant labor, yet did not surmount the dominant racial understanding that non-whites, especially those across the Pacific, were ill-equipped for representative government. As the media debate suggests in December of 1897, Hawaii represented a key component in the imperial and proprietary regional identity of Pacific market expansion. Hawaii, whether a state or territory fulfilled the desire to expand into Pacific markets. Whether the reporting was for or against a Hawaiian state it was San Francisco’s duty as the Pacific metropolis to develop the regions commercial markets. The media coverage implies the question of annexation was a particularly San Franciscan issue, effecting little of the rest of the country. From the Klondike Gold Rush, to Hawaiian Annexation, to market expansion in the Orient, San Franciscan’s were educated through the media and in politics as to the significance of their city in the Pacific region and its position in the expanding American empire. In a way, San Francisco’s urban identity extended the Pioneer Myth narrative of California and San Francisco as west of the west, a product of American labor, and metropolis of the Pacific Coast. In Part III, we will look into some of the many ways that this urban identity was developed and transmuted throughout California and San Francisco. Kahn, Judd. Imperial San Francisco: Politics and Planning in an American City, 1897-1906. Lincoln, Nebraska: University of Nebraska Press, 1979. Berglund, Barbara. Making San Francisco America: Cultural Frontiers in the Urban West, 1846-1906. Lawrence: University Press of Kansas,2007. Gendzel, Glen. “Pioneers and Padres: Competing Mythologies in Northern and Southern California, 1850-1930.” Western Historical Quarterly 32 (Spring 2001): 55-79. Rosenberg, Emily, and Eric Foner. Spreading the American Dream: American Economic and Cultural Expansion: Hill and Wang, 1982. You are currently reading Commemorating Regional Empire, Part II: “A Pacific Metropolis,” San Franciscan Visions of Urbane Grandeur at Gilded Empire.